Audiofeed Christian Rock Festival brings on HipHop Artists, Spoken Word Poets, and a DJ! 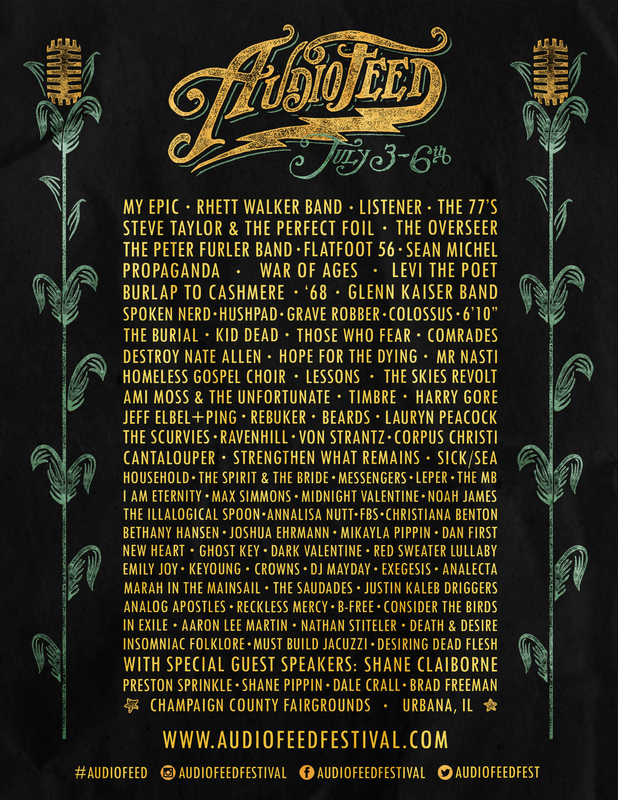 From 1991 to 2012, Bushnell, Illinios was the hometown to one of the largest Christian Music and Arts festivals in the world, known as the Cornerstone Festival, which now no longer operates. In 2013, across the state in Urbana, Illinios, fans of Cornerstone launched a new Christian Festival called Audiofeed . Urbana is a growing midwest town, with a population of just over 40,000, the 10th largest city in the state. Noted as having the popular Urbana Sweetcorn Festival, the town has many diverse cultural venues and events. Audiofeed hosts their 2nd annual event July 2-6, 2014 and the Champaign County Fairgrounds in Urbana. Christian Rock bands will have a dominate presence at the festival, but, they also will be having 24hr prayer and worship throughout the weekend. Thursday night features a Spoken Word event hosted by Keyoung, Levi the Poet, and many others. In addition, Los Angeles rapper Propaganda will be bringing truth to Audiofeed, as well as, a few other hiphop artists: The MB, B-Free, Lamorax, DJ Mayday, and Nashville rapper Spoken Nerd. Springfield Christian DJ brings the Mix Masters touch to the hiphop performances throughout the festival. Host of Street Light Radio, now featured on Friday Night Lights in Savannah, GA.